Thank you for choosing NetBurner for your product development. We ask that you please take a few seconds to create a support account so we can provide you with the latest software release. NOTE: You will need to enter the entire serial number including the platform type (no spaces). 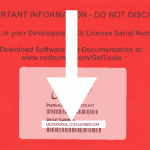 The red card that came with your development kit contains the serial number you will need to create your support account and to install the software. Application Notes: Available on product page for each hardware platform.